Oftentimes the views from our stateroom on the ship are absolutely breathtaking. Here is our sunrise view in Bordeaux. It’s not often that Jerry and I find a place we love so much that we start looking at real estate (at least rentals) to see if maybe we could live there for a few months. Bordeaux was one of those places. 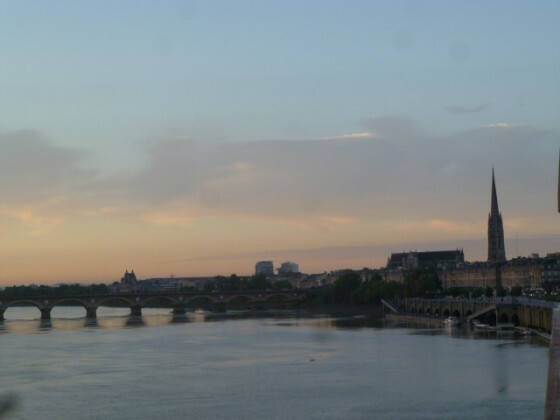 Bordeaux has many of the finest qualities of Paris but without the Parisians – the folks in Bordeaux are warm and welcoming. It’s a city that was designed with a lot of forethought. There are wide promenades all along the river with plenty of room for bicycles, runners, skateboarders and strollers, with room to spare. Those promenades are interspersed with big beautiful flower gardens. 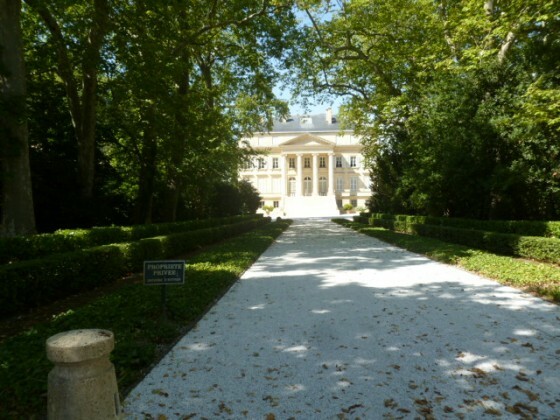 One of the most famous views in the world of wine: Chateaux Margaux. It was closed for renovations but we got to stand at the gates. 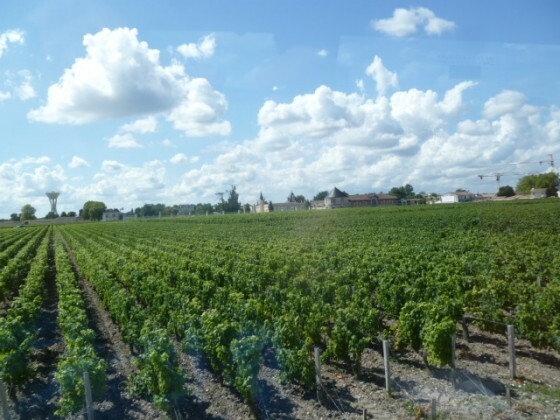 There’s no denying that Bordeaux is best known for its wines. That’s what brought Dewey Markham, Jr., a native New Yorker, to the area twenty years ago. He was writing a book about the 1855 list of best wines and how wines are judged in Europe. He fell in love with Bordeaux, married a “local girl” here and is raising two bilingual children. He is a delightful man, with a great sense of humor and none of the pomp or snobbery one tends to expect of someone so steeped in the knowledge of wine. We spent a delightful day with Dewey visiting two chateau (that’s what they call wineries here.) 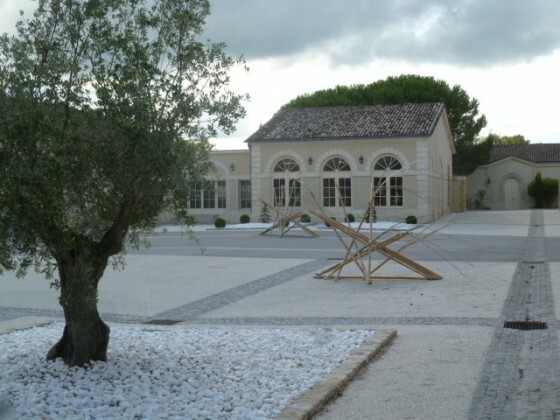 As we drove to the first, Chateau Giscours, Dewey explained why Bordeaux has the perfect conditions for wine growing. Irrigation is not allowed in Europe so the soil and weather must be perfect. 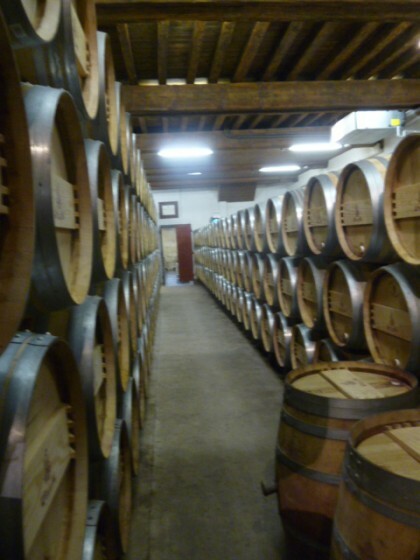 Oak barrels (French oak of course) at Chateau Giscours. Each barrel costs $700 when new. The area used to be inundated with water but the French invited the Dutch to come to Bordeaux and help them drain the land. This left the land with a thick layer of gravel on top and clay soil on the bottom – ideal for the ripening of the grapes. 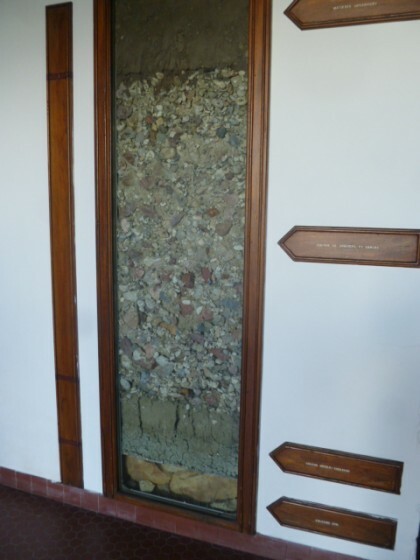 A great way to show us how the soil looks, layer by layer. The gravel is critical, as it holds in the heat of the sun, reflecting it back on the fruit to help “the berries” (as they call the grapes) ripen most sweetly. The second chateau we visited was Lagrange, which is owned by, would you believe, Suntory. We liked the white wine (rare to have a white Bordeaux but it was delicious – reminded me of a viognier) and one of the Cabernet Sauvignons. The bamboo sculptures give you a sense that the owners are Japanese. Jerry found the attractiveness of the young French women who were our chateau guides to be quite distracting. Ah, those French women….they have that je ne sais quoi! Pouring the yummy white at Chateau Lagrange. The cheeses were amazing too! Did you know that after the barrels are used for wine for three to five years, they are sent to Scotland or Ireland to be used for whisky? It’s not harvest time yet, but workers were checking the vines and removing dead leaves to let more sun get to the grapes. Posted in Travel	| Tagged Bordeaux, Dewey Markham Jr.